The Dark Knight Rises is the last film in Christopher Nolan’s Batman trilogy. This newest movie finishes up the story that starts in Batman Begins and continues in The Dark Knight. I saw The Dark Knight Rises in the theater on Friday, and while it is entertaining, it definitely isn’t Nolan’s best film. Unfortunately, The Dark Knight Rises is riddled with plot holes and overlooked details. I’m not being nit-picky here; there were many moments during the movie where my brain interrupted with, “That doesn’t make sense.” This is called breaking the suspension of disbelief, and it’s something movies and books strive to avoid. My problems with The Dark Knight Rises are numerous, but there are plenty of other reviewers around the web who will go into the specifics; you don’t need me to repeat observations that can be read elsewhere. Instead, I present you with these ridiculous INFOGRAPHICS! Yes, after seeing the movie, I started comparing the villains from Christopher Nolan’s Batman trilogy, and I was able to succinctly express why Bane is my least favorite villain. These charts are very biased and totally subjective. If you disagree, that’s fine; everyone gets something different from a movie. However, if you agree with me, these charts will fill your world with happiness and sunshine! The first version of Christopher Nolan’s Rogue Gallery compares the main villain from each of Nolan’s Batman films: Ra’s al Ghul, Batman Begins; Joker, The Dark Knight; Bane, The Dark Knight Rises. 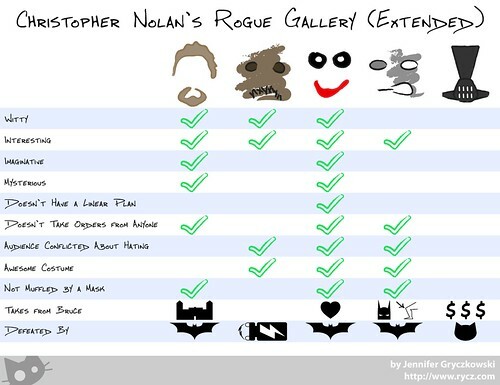 View Christopher Nolan’s Rogue Gallery Chart [Full Size]. The extended version of Christopher Nolan’s Rogue Gallery compares all of Nolan’s Batman villains: the three main ones previously shown plus Scarecrow from Batman Begins and Two-Face from The Dark Knight. 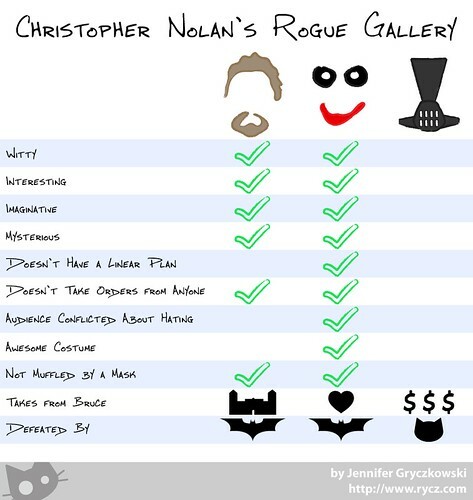 View Christopher Nolan’s Rogue Gallery Chart (Extended) [Full Size]. Scarecrow’s defeat at the hands of a taser is my favorite bit. It’s great to see him again when he cameos in The Dark Knight and The Dark Knight Rises. These charts were made for my own amusement, and now they’re posted on the web for your amusement, as well. Feel free to share them; just don’t alter them. Enjoy!